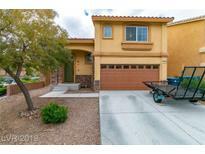 Below you can view all the homes for sale in the Highlands Ranch subdivision located in Las Vegas Nevada. Listings in Highlands Ranch are updated daily from data we receive from the Las Vegas multiple listing service. To learn more about any of these homes or to receive custom notifications when a new property is listed for sale in Highlands Ranch, give us a call at 702-323-5933. Newer wood laminate flooring, plush neutral carpet, shutters, TAPCO security screens on ground level, granite counter tops, huge island, built in refrigerator, spacious loft, large master suite, ceiling fans, professionally landscaped front and back. Move in condition! MLS#2089759. Elite Realty. The backyard has just been upgraded with fresh landscaping! ! MLS#2089280. Maxim Properties. Beautiful well kept home built in 2017 on a nice size lot ready for you to make it your own. MLS#2089447. Milestone Realty. HIGHLY UPGRADED HOME,FEATURING Fully remodeled Kitchen : Backsplash, Quartz countertop with Single-basin undermount sink & spring extendable faucet,Soft-close cabinets, island with microwave additional cabinets/shelving;Spare bedrooms: Jack&Jill bedrooms & full bath with double-sink vanity,Master: large walk in closet , Master bath double sink vanity and walk-in glass shower.Backyard WITH large patio cover spanning length of home with pavers! ! MLS#2087558. King Realty Group. Flexible floorplan allows for traditional 3 story home lifestyle (4 bed,3.5 bath,loft) with massive 3rd floor loft(22x20) + 3 bedrooms(2rd floor) that can be used as a separate living area. MLS#2086511. United Realty Group. Live In Luxury And Schedule A Tour Today! ! MLS#2084799. Maxim Properties. Backyard patio with just enough room to plant some luscious plants! MLS#2085372. Signature Real Estate Group. Master bath boasts mosaic tile walls, quartz waterfall countertop & CLAW TUB! Tranquil backyard POOL! MLS#2080834. Province Real Estate. Thousands in upgrades everywhere you look. MLS#2084368. BHHS Nevada Properties. **hurry- This New Listing Won'T Last..! ** truly A Must See..! ! MLS#2083447. Realty ONE Group, Inc.
Large master bedroom with on suit complete with a huge walk in shower. Stunning staircase and more! MLS#2083915. Resolution Realty. New Laminate Flooring W/Fireplace & Cntrl Vac. Must See MLS#2083358. Realty ONE Group, Inc.
No need to wait for months of build time! MLS#2083462. Realty Brokers, Inc.
3rd flr Master & addtl 3 bedrooms upstairs and full bath. Culdesac &Backyard done! ! MLS#2083335. Keller Williams Realty Las Vegas. Solar Screens Throughout, Tankless Water Heater, Stainless Steel Appliances with HUGE Expanded Built-In Refrigerator, Upgraded Ceramic Tile Throughout, and MUCH More. MLS#2082482. Love Local Real Estate. Very low HOA. Come see this beauty today! MLS#2082214. Keller Williams Southern Nevada. Master can be your own retreat with huge walk in closet & spa like master bathroom. TOO MUCH TO LIST MLS#2081610. Platinum R.E. Professionals. Dont miss this beautiful like new home! !Wont last long! ! MLS#2081457. Realty ONE Group, Inc.
Only minutes away from I-15 Freeway, Shopping Centers, upcoming Raiders Stadium, and the Las Vegas Strip! Talk about... Location! Location! Location! MLS#2078958. Realty ONE Group, Inc. Owner's suite with spa like bathroom. Low HOA. A must see... MLS#2075438. Realty ONE Group, Inc. Flexible floorplan allows for traditional 2 or 3 story home lifestyle (3 bed,2.5 bath,loft) with massive 3rd floor loft(25x20) + 2 bedrooms(3rd floor) that can be used as a separate living area. Backyard oasis. Home warranty included MLS#2072017. BHHS Nevada Properties. Easy access to Mtns Edge amenities. MLS#2069765. Realty ONE Group, Inc.
2 Car garage. Including solar screens MLS#2063343. BHHS Nevada Properties. Corner Lot Allows Room For Recreational Storage, Small Rv MLS#2059045. Simply Vegas. Covered Patio And Desert Landscaping With Artificial Turf In The Backyard. A Must See! MLS#2058924. City Villa Realty & Management.